Huge thanks to Barb who lent us her backyard and shared her wisdom about all things decomposing. 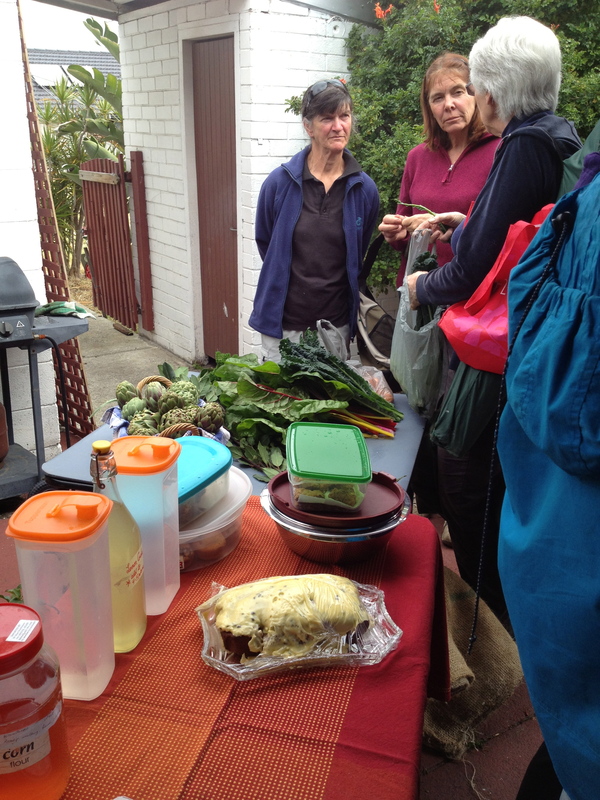 It was the fifth workshop put on by the TTG Kitchen Gardeners’ Society, part of a series on producing your own food, a key aspect of building a sustainable community. There’s a lot said about compost – but really it’s about soil health and reducing waste. It doesn’t smell (or if it does, you’ve got it out of balance and it’s easy to fix), isn’t dirty or dangerous, doesn’t have to take up much space, and is very good horticultural practice. Here’s Barb with her enormous pile of poo. That is, horse poo, nicely broken down and ready to be added to her sandy soil where her vegetables will appreciate the boost of nutrients and water-holding qualities it will provide. When you add manure to your garden, that is, manure that doesn’t come out of a sealed plastic bag, there are a few considerations. 1. Its freshness – newly, erm, laid poo tends to be fairly strong and can burn plants, especially seedlings. 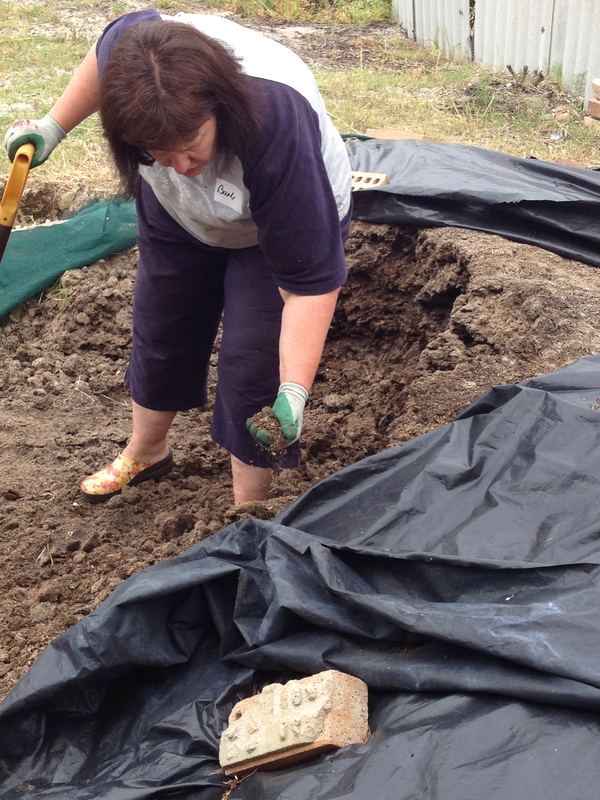 It’s always best to let it break down for six weeks or so before you add it to your garden bed. Chook is the harshest, while horse, cow or sheep is milder, but it’s still a good idea to let it mature a bit. 2. Seeds the animal has eaten that have passed through intact – considering poo is an ideal growing medium, viable seeds of oats and wheat will sprout as soon as they can. You can let them sprout then dig them in as green manure, or if you compost it aerobically, it should get hot enough to kill off any viable seeds. 3. Any residual medication with which the animal may have been treated – this is a hard one. Worming formula, for example, will likely kill lots of the good organisms in your soil. Your best bet is to source your poo from someone you know who doesn’t use these sorts of medications. Making good compost is a balancing act – nitrogen and carbon, wet and dry organic material, and making sure it’s aerated. 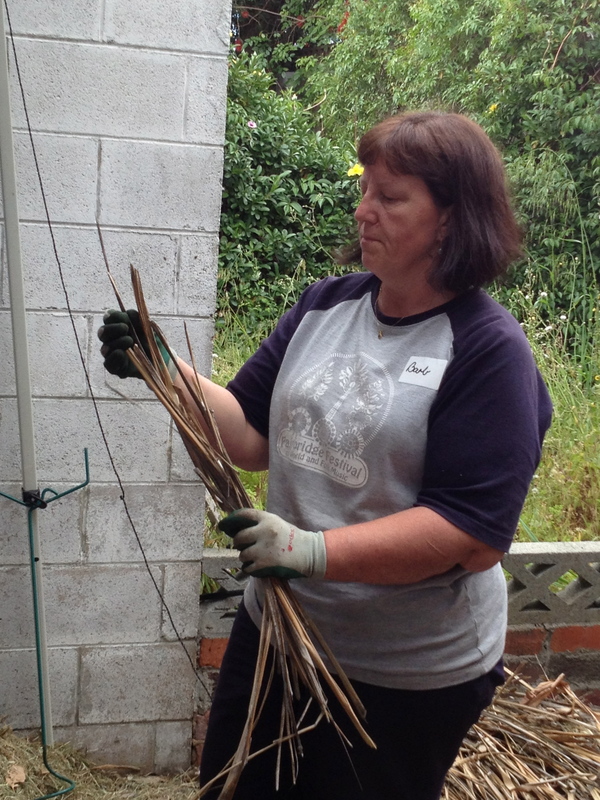 Lots of dry garden waste, such as these palm fronds need to be balanced by a high-nitrogen, moist ingredient, such as, well, poo. Barb also introduced us to her worm farms and her bokashi bins. She has a system set up with friends who fill the bokashi bins, which she picks up, replacing a full bin with an empty one every few weeks. She then buries the bin’s contents, and uses the liquid as a foliar fertiliser and to help keep her drains clear. Her worms take care of a lot of kitchen waste, but worms don’t like meat, citrus or oniony meals. They need to be kept cool and moist, which can be a challenge in Perth. The Kitchen Gardeners’ Society always has afternoon tea and shares produce. The compost and worms workshop fitted in nicely with TTG’s recent waste and recycling survey, in which a large majority of respondents said they’d like to reduce their waste. Composting is an excellent way of using up organic scraps, feeding your garden and reducing landfill. If you don’t have room in your backyard, a bokashi bin under your sink will allow you to deal with food scraps in a very environmentally friendly way. The bins and the starter culture are available from hardware stores and eco outlets. Our next workshop is on preserving the harvest on Sunday November 4. RSVP to guilfordkitchengardeners@gmail.com if you’d like come as numbers are limited. This entry was posted in Food, Take Action, Waste & Recycling and tagged Composting, Kitchen Gardeners, Worm farms. Bookmark the permalink.